I’m winding down my short stay here in McCarthy, prepping for the winter. I’ve painted half the inside of the cabin, chopped a bunch of wood, and done a few other odds and ends. 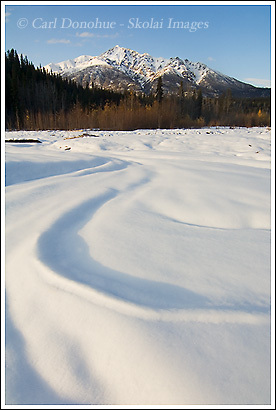 I also scouted out a few photo opportunities for this winter, though I didn’t get to shoot much this last few weeks. We got a solid dumping of snow almost a week ago, and most of it is still packed on the ground – the temps have hovered around 40 deg most days, so there’s not much melting. As I write this, a few lonely snow flakes drift down from the clouds – and from the looks of things, another snow storm is not far away. I’ll be heading back towards Anchorage in the next few days, where I’ll stay for a while to do website updates, photo editing, other office work, etc – it’s a tedious time at the end of summer. Once I get that stuff tended to, I’ll stock up on food and supplies, and return to the cabin for the winter. I’m keen to venture a little further afield this year, explore the place in more detail, and try to get some good winter shots. I think I’m a bit better prepped this year, and have a better idea of how this all works. We’ll see. The summer is now gone, too quickly, as always. They say fall has just begun, but I’m pretty sure it’s gone too – unless by ‘fall’ they mean ‘snowfall’ – my car outside is slowly getting a nice covering of the white stuff. As always, I’m already thinking about tentative plans for next summer. I don’t know yet exactly what they’ll entail (hence ‘tentative’) but at this point, I’m fairly certain they’ll include a good deal of me wandering around the mountains of Wrangell – St. Elias National Park, looking for some sunshine. This entry was posted in Adventures, Alaska, Backpacking and Hiking, Fall, Landscapes, Travel, Winter, Wrangell - St. Elias National Park on October 8, 2008 by Carl D.
Loved your pic of the buck at Cades Cove! Beautiful pic. And I know next year that you’ll have a really great summer, as always, with fantastic stories, facts & pics! I have learned a lot from your website & enjoyed every minute! Looking forward to more, more,more! Thanks for the comment. I’m glad you enjoy the post, it’s nice to hear from people who get something out of visiting here. And I’m probably even MORE keen than you are about next summer. I can’t wait. In the meantime, there’s this thing called an Alaskan winter I’m supposed to endure. We got buckets of rain not long after this, nasty, ugly drizzly rain – made my drive out of the park REALLY exciting, on top of the snow and ice that was on the 60 miles of pot holed, boulder strewn, “road”. I’m sure by the time I get back to the park it’ll be all snow, and no rain for a few months. Speaking of snow, I was thigh deep in the stuff 2 days ago, climbing some peaks in the area. Crazy weather, this Alaska.